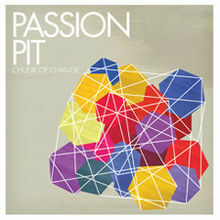 Chunk of Change is the debut EP by American electropop band Passion Pit, released on September 16, 2008 by Frenchkiss Records and Columbia Records. A video for the single “Sleepyhead” was released in October 2008, directed by The Wilderness. The track was featured in the debut trailer for the 2011 video game LittleBigPlanet 2. “Better Things” was sampled by the alternative hip hop duo Chiddy Bang for their 2009 song “Truth”.